Gargantuan with a Witch Doctor. Gargantuan is a Voodoo Witch Doctor skill unlocked at level 19. It summons a large huge, humanoid zombie to fight for the Witch Doctor. The Gargantuan deals considerably damage and certainly looks imposing, at more than double the height of a human, with skulls and other objects dangling from chains and hooks set into the undead behemoth's body. Post release this skill, like all the other pet skills in the game, was basically useless at higher levels, as the Gargantuan did not scale up enough in defense or hit points to remain alive for more than a few seconds on Hell or Inferno difficulties. The Witch Doctor summons forth a huge lumbering gargantuan to do his bidding. The following is a very quick summary. See the Gargantuan rune effects page for a more thorough description of rune effects, or any of the individual rune pages for numbers, screenshots, blue quotes, and much more. 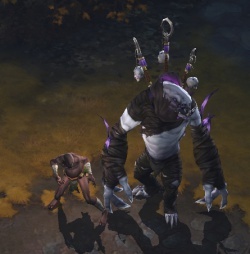 One of the newest pets that we've added to the Witch Doctor, which is the Gargantuan, which is a big giant, kind of, tough zombie creature that is designed more to absorb damage and kind of distract enemies. It certainly looks more than capable of dealing as well as absorbing damage. 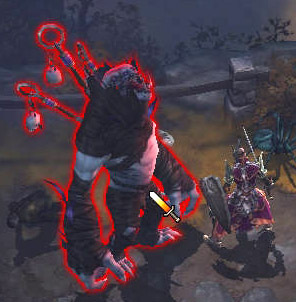 Gargantuan was listed amongst the Witch Doctor's skills at BlizzCon 2009 and BlizzCon 2010, but was never seen in use. Skill tiers were removed shortly before the beta started in September 2011, and Gargantuan became a level 18 skill. The skill system was once again overhauled for the Beta Patch 13 in February 2012, and Gargantuan was classified as a Voodoo skill and moved to level 19. Prior to release, Gargantuan had never been seen or used by players. Immediately after release, this skill was as useless as the other pet skills, since the Gargantuan did not scale up enough in defense or hit points to remain alive for more than a few seconds on Hell or Inferno difficulties. This page was last edited on 8 June 2012, at 01:44.